Raymond F. Schinazi was recognized for his extraordinary contributions to science and to human health. The American Liver Foundation has awarded Raymond F. Schinazi, PhD, DSc, with the Distinguished Scientific Achievement Award. Schinazi was recognized for his extraordinary contributions to science and to human health, particularly for developing treatments for HIV/AIDS, hepatitis B virus (HBV) and hepatitis C virus (HCV). Schinazi is the Frances Winship Walters Professor of Pediatrics in Emory University School of Medicine; director of the Laboratory of Biochemical Pharmacology; Senior Research Career Scientist at the Atlanta Veterans Affairs Medicine Center, and director of the Scientific Working Group on Viral Eradication at the Emory Center for AIDS Research (CFAR). The Distinguished Scientific Achievement Award is the American Liver Foundation’s most prestigious award, honoring a scientist who has made a major contribution to liver disease research in basic science or in its application toward the prevention, treatment or cure of liver disease. A world leader in nucleoside chemistry, Schinazi is best known for his pioneering work on HIV and HCV drugs d4T (stavudine), 3TC (lamivudine), FTC (emtricitabine/Emtriva), LdT (telbivudine), and most recently sofosbuvir (Sovaldi), which are now approved by the FDA. In the early 1980s when scientists realized that AIDS was caused by a virus, Schinazi set up the first HIV laboratory at Emory and pursued the development of novel antiviral drugs. It is estimated that today more than 94 of people in the United States infected with HIV, and many more around the world, take one of his drugs and that his innovative work has saved over 6.5 million lives. His contributions related to HCV are expected to have a profound positive impact on the approximately 170 million people worldwide suffering from chronic infection. Schinazi received his BSc (1972) and PhD (1976) in chemistry and an honorary DSC (2006) from the University of Bath, England. He completed postdoctoral training in pharmacology at Yale University and in virology/immunology at Emory University. He has authored more than 500 peer-reviewed papers and seven books and holds more than 92 issued U.S. patents, 45 published U.S. applications, 39 PCT International applications, and 121 non-U.S. national stage patents and patent applications, which have resulted in 13 New Drug Applications (NDA). He is the founder of five biotechnology companies focusing on antiviral drug discovery and development: RFS Pharma, LLC (2004); ActivBiotics, LLC (2008); Pharmasset Inc. (acquired by Gilead in 2012), Triangle Pharmaceuticals (acquired by Gilead in 2003); and Idenix Pharmaceuticals (51 percent acquired by Novartis in 2003). 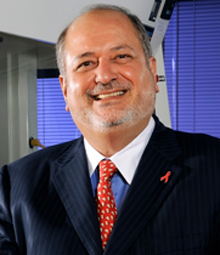 Schinazi is the recipient of numerous awards including the Georgia Biomedical Industry Growth Award (2006), the Distinguished Scientist Award from the Hepatitis B Foundation (2006), the Ewing Marion Kauffman Foundation’s Top Innovators in America Award, and two Merit Awards (10-year grants) from NIH-NIAID. He was inducted into the Technology Hall of Fame of Georgia (2012), and he received the Intellectual Property Legends Award (2012). He was selected as a Charter Fellow by the National Academy of Inventors (2013) and was awarded the 2014 Research & Hope Award for Excellence in Academic Research by the Pharmaceutical Research and Manufacturers of America (phRMA).